Hemp Bombs is on the cutting edge of the CBD industry for its products and marketing efforts. WIth fully specialized teams in social media, web development, affiliate marketing, and graphic design, Hemp Bombs is able to create opportunities that competitors simply can’t. With that said, Hemp Bombs is proud to introduce the “Instagram Insider Program,” a first of its kind in the industry. Instagram Insider is a partnership between Hemp Bombs and various Instagram influencers/accounts. It is closely tied in with our in-house affiliate marketing program, which is a success in its own right. As a platform with almost one billion users and high engagement, Instagram is a huge marketplace ripe with opportunity. Businesses think that influencer marketing is one of the most important marketing initiatives. We do too. While our affiliate program has had success working with other websites and even YouTube channels, @happyhempman opened our eyes to the value of affiliate marketing on instagram. By following an easy two step process (we’ll explain later), @happyhempman was able to make thousands of dollars through commissions on his Instagram page. As a business, we benefited from exposure and sales. @happyhempman benefited by receiving commissions on those sales and a steady paycheck. Now that we have proof Instagram is a good place to market our products, the question is, how can we convince more influencers to work with us? The answer we came up with? Pay them. Check out the table below to see the rates we came up with. The left hand column charts the number of followers a page has and the right column shows their rate of pay. It’s important to note that the right-hand column includes a one-time bonus as well as the flat commission rate. Think of the payment as a commission + signing bonus. The more followers you have, the higher your rate. While we are confident in our product, we understand that it may not be the perfect fit for every page. So, that’s why we have created terms for any partnership we would begin. Hemp Bombs has a mandatory 14 day trial period for any new Instagram user entering into the Instagram Insider program. The signing bonus will be paid in full at the end of the 14 day signing period, as longs as the terms are followed. Should for any reason the terms are broken, the Instagram page forfeits their commission and signing bonus. The payments will be made according to the rates on this page. All partners will be paid a signing bonus (follower dependent) and a flat rate of 20% on every sale generated. There is no limit to the amount of money or sales you can refer. The signing bonus will be paid at the end of the successful trial period and commissions are paid out every Friday. We ask that any “Insider” makes at least five posts and two Instagram stories featuring Hemp Bombs products through the trial period advertising our product and referring viewers to the link in the bio. Any Insider will forfeit rights to any bonus and commissions should they defame the product or brand in any way. As far as the content creation, the page may choose to make posts independently of Hemp Bombs or in collaboration with. Hemp Bombs has a team of content creators and designers that can make custom posts perfect for your audience. 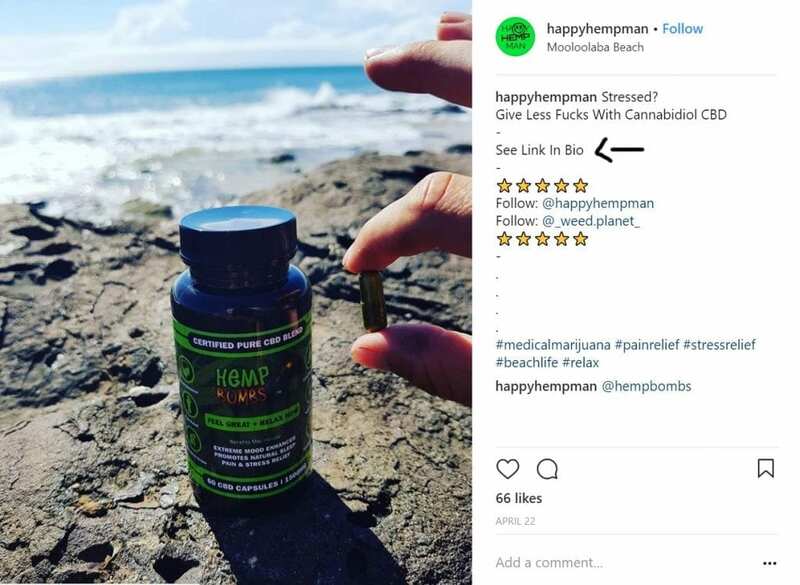 In order to track sales and visits from an Instagram page, Hemp Bombs will provide a unique link that should be placed in the bio. Here is an example of @happyhempman’s Instagram page, with a link included in his bio. Whenever Hemp Bombs creates a link for you, this is the location on your page you should place it. Then, in posts (5 or more), make sure you point visitors back to your link so you can get credit for sales. Check out the image below to see how @happyhempman does it. 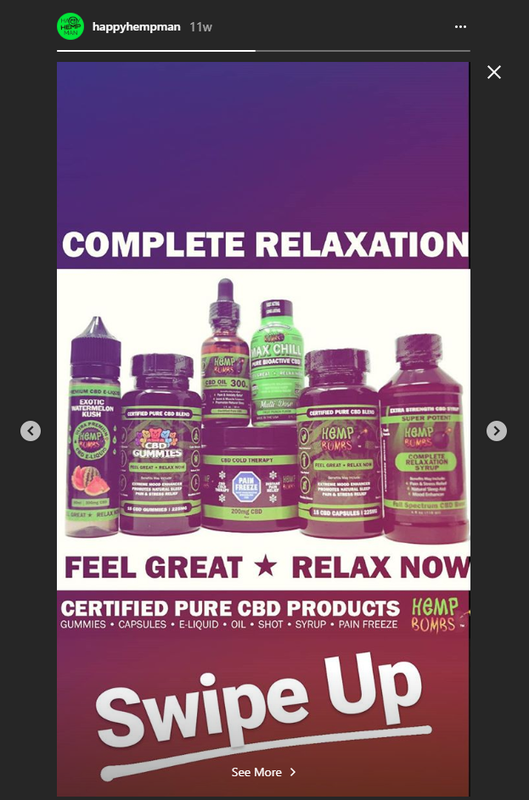 As well as posting an affiliate link in your bio, Hemp Bombs also encourages you to change your "personal" account to a "business" account so you can place affiliate links in your Instagram Stories. For more information on Instagram Stories please visit our page on Instagram Affiliate Marketing. Do you like what you’ve read? Are you interested in utilizing your Instagram account to start making money? Go ahead and sign up to our affiliate program to get started. Do I have to use all your products or could they just be one? Bryan, you can advertise whichever products you would like. You can sign up on our “become an affiliate page” under our affiliates tab in the menu. Hi. How do I sign up if I am already an affiliate?